When many senior college students are asked about their future plans as they hit September of that final year, a lot of them respond, “I have no idea where I will be a year from now.” But that is not the case for Mason Cloy. The graduate offensive lineman will follow in the footsteps of his grandfather, uncle, and father in joining the United States Army. Cloy grew up the military way with more than one hometown. However, South Carolina has been his home state for close to a decade, as he attended Spring Valley High School in Columbia prior to enrolling at Clemson. At Spring Valley High, Jimmy Noonan coached and developed him into a successful college recruit. In addition to Noonan, Cloy’s offensive line coach, Mike Armstrong, also played a large part in his development as an offensive lineman. As a senior, Cloy was an all-state pick, was chosen as the team captain for the Max Emfinger All-American Bowl Classic East team, was selected by the South Carolina Coaches Association as the Lowerstate AAAA Offensive Lineman-of-the-Year, was a Carolina Panther Community Captain Award recipient, and was a Wendy’s High School Heisman Award recipient. He also had 57 knockdowns as a senior and established a school record with 175 career knockdowns. As a tight end, he added 16 catches for 251 yards and three touchdowns in his career. Cloy was well on his way to becoming an asset to whichever school he would choose. He was rated by Scout.com as the #9 center in the nation and #11 overall prospect in South Carolina. He was also rated as the #10 center in the nation and #15 prospect in the state by Rivals.com. In addition to the Tigers, Cloy considered Georgia Tech, Kentucky, Louisville, North Carolina, N.C. State, South Carolina, Vanderbilt, Virginia, and Virginia Tech. Luckily for Clemson, he was successfully recruited by Offensive Line Coach Brad Scott. However, Cloy chose Clemson for more than just football. An equally-important factor in choosing a college was the ROTC (Reserve Officers’ Training Corps) program. At Virginia Tech, for example, one cannot participate in ROTC if he is on the football team. During his time at Clemson, he has participated in physical training with ROTC while also lifting weights with the football squad. Cloy arrived in Tigertown for the 2007 season. Like many offensive linemen, he red-shirted that first year. The following season in 2008, he was second on the team in knockdown blocks (53) and was fourth among offensive linemen in terms of film grade (72.2) as a red-shirt freshman. He also set a school record for snaps by a freshman offensive lineman (660), including 53 in the Gator Bowl against Nebraska’s tough defensive line that included Ndamukong Suh, now an NFL All-Pro. His 2009 season proved to be just as successful with 52 knockdown blocks as he played in 13 of the 14 games. 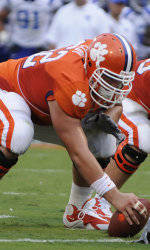 He helped the Tigers to nine victories, the ACC Atlantic Division title, and a final top-25 ranking. The only game he missed was the bowl contest against Kentucky after he suffered a broken leg versus Georgia Tech in the 2009 ACC Championship game. In 2010, he had another solid season with 31 knockdown blocks in 356 snaps over 12 games. For the second straight year, he was named to the All-ACC Academic team. He entered his final year with 136 career knockdown blocks, second-most among active Tigers. Clemson is expecting big things from the offensive line this season, especially with new playmakers on Cloy’s side of the ball that include a new quarterback and some young skill-position players. However, Cloy knows his unit, led by first-year Assistant Coach Robbie Caldwell, is up to the task. “It all starts with the offensive line and we have a veteran group who is filled with team leaders,” stated Cloy. One of the reasons for Cloy’s success in all areas has been his willingness to learn from veteran players who preceded him, in particular Thomas Austin and Michael Palmer, two former Tigers who were All-ACC Academic members now in the NFL. As if football and ROTC are not enough, Cloy worked hard in the classroom before earning his park & protected area management degree in May. He is a three-time ACC Academic Honor Roll member along with being a two-time selection to the All-ACC Academic team. As much as Cloy loves Clemson, it is surprising to find out that he is the first Clemson graduate in his family. Most of his family members attended Southern Mississippi. Cloy is the son of Michael and Debbie Cloy and has an older sister, Melanie. His father, Colonel Cloy, is the former Chief of Staff for the United States Army Cadet Command. He also knows his four years in his beloved college town have prepared him well for his upcoming endeavors in the Army. The challenges of the classroom and the gridiron have served him well, but the challenge will go to another level when he begins his career in the Army. Cloy has been groomed for a military career all his life, and those who have been around him know he will be up to the challenge. Just ask his coaches, his teammates, his teachers, or his classmates.